371 Crown Street, Gorbals, Glasgow. This was one of the last pubs to be demolished in old Gorbals. Situated at the corner of Crown Street and Caledonia Road. This old pub was established in 1875 by landlord William Bryson. Mr Bryson lived then at 389 Cally Road before moving to better accommodation at Victoria Cross, Govanhill then to Mount Florida. 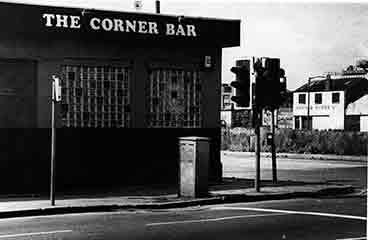 The Corner Bar from Caledonia Road. Many will still remember this old pub when it was called the Waverley, owned by John Boyle. Also known as Dixon Blazes. 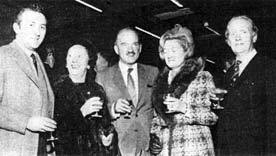 Left to right John Boyle; Mrs and Mr R Gibson, Black Bull, Rutherglen; Mrs and Mr D A Maclean, the Phoenix. 1970. John Boyle wins Brady Trophy. 1970. 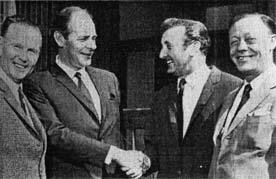 Left to right; E Smythe, president, Glasgow Vintners' Golf Club; L Brady, Bray and Co., Glasgow; John Boyle and W Martin, acting secretary, Glasgow Vintners' Golf Club. 1970. Dixon Blazes from Crown Street. 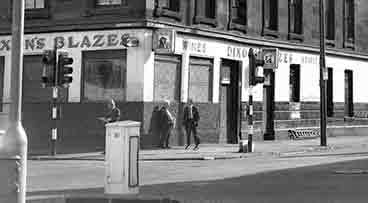 Tuckers (left) and Dixon's Blazes pubs on street corners in Govanhill, but no houses in between. Watering Holes in Govanhill Desert. They stand like oasis in a Glasgow desert...the watering holes of a square mile of Govanhill left derelict by the planners and demolition men. 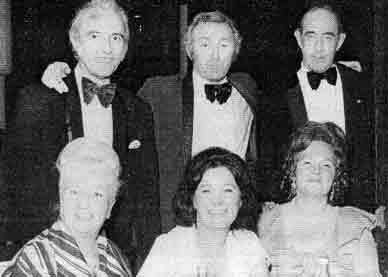 They are eight pubs in the area around Caledonia Road where no one lives any more. But the "nomads" still return to the oasis. Customers travel from all over Glasgow for a pint in the howffs they still regard as their locals although they have lived for years on the city's outskirts. One regular is Jim Toner who travels from Ardencraig Road, Castlemilk for a pint in Hugh Gallagher's Govanhill Bar. said Jim, "I have been living in Castlemilk for 22 years but I still regard this as my local. I used to live in Oatlands. The Govanhill Bar is the third bar owned by Mr Gallagher that Jim has frequented. All have been in the same area. "I suppose you could say I'm following him around." Jim said. As for Mr Gallagher, he's doing quite nicely, thank-you. He said, "There hasn't really been a drop off in trade since they knocked down all the houses. A good pub keeps its regulars. Hugh O'Neill, the manager of Derry Treanor's said: "I don't think you will find any pub complaining about lack of trade. The regulars keep coming." And there are even better days coming. Eventually all the ground left bare by the demolition of tenements will be built up again bringing new trade into the area. Another licensee not worried by the depopulation of the area is Mrs Sophia Seils. She was so determined to hold on to the Blarney Stone, which has been in her family for 45 years, that she bought the two shops next door to keep the ground floor of the tenement. The upper floors have since been demolished but Mrs Seils has rented out the two shops to a butcher and a newsagent. She said: "I came into this pub 12 years ago to help my late husband when his charge-hand retired. I've worked here ever since. "It's a great pub and the regulars always come back." The other pubs, which stick out like sore thumbs among the dereliction include Tuckers, Dixon's Blazes, The Hi Hi, the Grant Arms and the Club Bar. If there are any more, forgive us, but eight pubs in one day is enough for anyone. 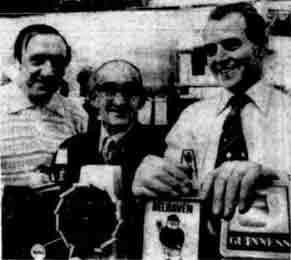 Jim Toner (Centre), one of the regulars in the Govanhill Bar with owner Hughie Gallagher (right) and barman Joe McGuigan. 1977. The Blarney Stone, It's been in the same family for 45 years.